...just a note to say that the following stats are out of date and not fully representative of the final incarnation of this monster in the official release. I'll update the actual stats shortly before the Bestiary is released. Special Attacks: Earthquake, rend, silent scream, spell-like abilities, summon titan, weakness gaze. Special Qualities: Abomination traits, damage reduction 20/epic, holy and piercing or slashing, fast healing 20, legendary strength, sonic immunity, spell resistance 55. Skills: Climb +88, Hide +47, Intimidate +54, Jump +88, Knowledge (the planes) +49, Listen +48, Search +48, Spellcraft +49, Spot +48. Feats: Cleave, Exotic Weapon Proficiency (Spiked Chain), Great Cleave, Improved Critcal x2 (Slam and Spiked Chain), Improved Initiative, Improved Natural Attack (Slam), Improved Sunder, Power Attack, Weapon Focus (Spiked Chain). Epic Feats: Armor Skin, Blinding Speed, Devastating Critical (Spiked Chain), Dire Charge, Epic Prowess, Overwhelming Critical (Spiked Chain). Organization: Solitary or with 1d4 Titans. This grotesquely powerful humanoid stands nearly twice the height of a man with an impossibly muscled frame almost as broad as the creature is tall. Its bronzed and weatherbeaten limbs bulge ridculously in some twisted parody of power. Its bald head, tiny by comparison to its prodigious physique, appears to have its mouth sewn and stapled shut. Beady red eyes stare defiantly from dark sunken eye sockets. The creature wears only a loin cloth to hide its modesty, though a huge black spiked chain orbits its body like some unholy flying serpent hunting for prey. The monster flexes its mighty frame, seeking perhaps, to intimidate any foes with mannerisms not dissimilar to many primates. Strongest of all abominations, the anakim are the unwanted offspring born from the loins of deities of strength who satisfied their lust consorting, either wittingly or unwittingly with evil fiends. Anakim wander the lower planes seeking to prove themselves against all and sundry. Though their might is unquestioned, their lack of intelligence means they are ill-suited as leaders, though a few do carve out territories to lord over. Most though, find employ as enforcers for evil deities, however anakim will only serve those more powerful than themselves. When anakim meet others of their kind they must always prove who is the strongest, these contests are often brutal and bloody affairs. 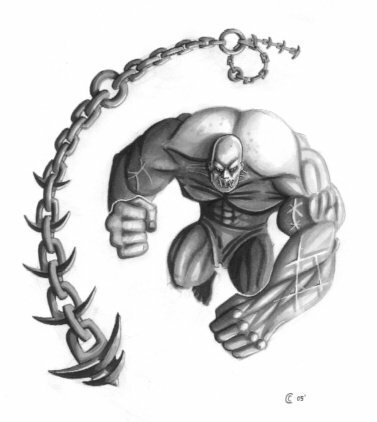 An anakim is 10 feet tall, some 8 or 9 feet across the shoulders and weighs a massive 250 tons (550,000 lb) due to extreme muscular density..
Anakim usually engage in wanton destruction causing as much collateral damage as possible until engaged by a significant challenge. They prefer to melee as many opponents as possible to inflict the maximum amount of pain with their silent screams. They use summoned titans to gauge an opponents power, so that they can identify and challenge the strongest foe. An anakims natural weapons, as well as any weapons it wields are treated as epic and evil-aligned for the purpose of overcoming damage reduction. Earthquake (Ex): As a free action an anakim can cause an earthquake (as per the spell) merely by its movements, though it must be touching solid ground to do so. Legendary Strength (Ex): The anakims strength is the stuff of legend. Their strength score is twice that of other abominations their size. Rend (Ex): If an anakim hits an opponent with both slam attacks it seizes the opponent and attempts to break them in half. This attack deals an additional 8d6+60 damage. Silent Scream (Su): Although their mouths are sewn shut, anakim can gesture as if screaming. This inaudible wail deals 45d6 sonic damage to all targets within 80 ft. Since the scream is silent, it affects the deaf and is itself uninhibited by spells such as silence. The attack is a standard action and the anakim can scream once every 1d4 rounds. The save DC is constitution based. Spell-like Abilities (Sp): At will - big clenched fist, big grasping hand, bull’s strength, greater dispelling, magic circle against good, righteous might, spell immunity, 3/day - big crushing hand, imprisonment (DC 25), meteor swarm (DC 25), 1/day - greater ruin (DC 26), superb dispelling. Caster Level 45th; Save DC 16 + spell level. Summon Titan (Sp): Four times per day an anakim can summon a titan. This is akin to a 14th-level spell. Epic Spell DC 70. Weakness Gaze (Su): Those within 40 ft. of the anakim must succeed at a fortitude save (DC 38) or be drained 1d10 points of strength. The save DC is charisma based. Prior to combat: Cast bull’s strength, magic circle against good, righteous might, spell immunity and summon titan. Round 1: Dire charge nearest group of opponents, allow spiked chain to dance delivering a full attack including an additional attack due to blinding speed against the suspected toughest opponent. Use silent scream against as many foes as possible. Power attack for 10 points with both spiked chain and slam. Round 2: Full attack, including an additional attack with dancing spiked chain. Cast big crushing hand on an opponent staying out of melee range. If majority of melee attacks hit in round 1, power attack for 20 points. If the majority of attacks missed, no longer power attack. Round 3: Full attack, including an additional attack with dancing spiked chain. Cast greater ruin on the most threatening opponent. If the majority of melee attacks succeeded in round two then power attack for 30 points this round. Round 4: Cast summon titan if still outnumbered, otherwise full attack with slams, including an additional attack unless opponent is staying out of range in which case cast superb dispelling. Either way the spiked chain continues to full attack, with an additional action. Increase power attack to 40 points if the majority of attacks succeeded last round. Round 5: Full attack, including an additional attack with dancing spiked chain. Use silent scream if still facing multiple opponents in melee. Otherwise cast greater dispelling at an enemy staying out of range. Low Epic: An anakim is strangled by its own weapon which seems possessed of a malign intelligence. Mid-epic: An anakim seeks to bring silence to the entire world by stealing sounds with an artifact ear trumpet known as the Horn of Deafening Silence. High Epic: It is rumored that the demon monarch Demogorgon is served by two anakim brothers. Minimising their sibling rivalry by stationing them on different layers of the Abyss.